The Diagnosis was Written on her Chest ! The emotional aspects of milk intolerance are so variable and so bizarre that it is difficult to select the most interesting and illustrative cases seen over the years. Emotional effects along with gastro-intestinal symptoms are commonly associated with migraine. 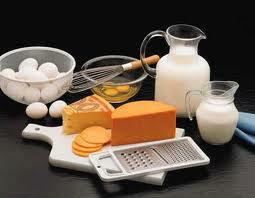 Milk intolerant children often have a short attention span, cannot sit still, and have tantrums and poor coordination. A tendency to self-injury and destructiveness sometimes occurs repeatably after drinking milk Their poor coordination is obvious in their writing and “art work”, because meaningless squiggles become recognizable objects or people after withdrawal of the relevant foods. Many years ago Professor Soothill at Great Ormond Street Children’s Hospital convincingly demonstrated the importance of foods in migraine by a double blind trial in 76 children who had all been relieved of their migraine on a “few foods” diet. Specific foods had been shown to provoke attacks after test feeds, so that the cause of their problems was already known. They were then given tinned foods as their only food source for a week, labelled with a code number. The tins either contained or did not contain normal amounts of the foods to which the children had already been shown to react, and neither doctors nor patients knew what foods were in the tins. Many foods were involved, but milk products were important in half the cases, and many children had abdominal pains and behaviour problems as well as migraine. When the code was broken it was found that the tins containing the foods known to upset the children accurately reproduced to a remarkable extent the various problems from which they had suffered. Unfortunately this important and scientifically performed trial, which was published in the Lancet, has attracted little or no attention and has been ignored or forgotten except by the few who are interested in the emotional effects of foodstuffs. For many years the effects of food and of dietary deficiencies on behaviour have been researched extensively by the application of restricted diets and supplements. Dramatic improvements in behaviour following dietary improvements were demonstrated in prisons for young offenders. The Hyperactive Childrens Support Group ( www.hacsg.org.uk ) directed by Sally Bunday, is a charity which has been a voice in the wilderness for over thirty years regarding the relationship between food and behaviour but continues to be ignored. The politicians do not seem to realise that revision of the diets in prisons could improve delinquent behaviour and even save money!. Unfortunately the medical profession seem to prefer to use drugs such as Ritalin to control unruly children, while the Ministry of Health, the Department of Education and other politicians have never paid attention to the defective diets of the future generation until Jamie Oliver, the TV Chef, demonstrated the effects of introducing healthy food on behaviour of children, occurring as an unexpected side-effect of a healthy diet. In 2011 NICE issued guidelines on the management of these problems in which the role of diet was not even mentioned! This demonstrates how the medical profession are completely oblivious to the role of diet in behaviour. Fiona was eight years old and had perennial asthma and seasonal hay fever. Father and uncle had seasonal hay fever . She also had bedwetting, hyperactivity, and tantrums, and was a miserable and unhappy, all common features of food intolerance. Her school performance was poor because she could not concentrate or sit still, After three months on a milk-free diet she was a happy bright child with a new personality, and her writing had improved remarkably, as shown below. As a reward for putting up with a milk free diet she was given a Big Mac hamburger, with the result that she reverted to her former miserable self for three full days. Her coordination, writing, and behaviour all were affected just as before. Another Big Mac was suggested to make absolutely sure, but her mother refused to give her another as the effects had been so obvious. Recent studies from New Zealand have shown that the more hamburgers children eat, the more likely they are to develop asthma! 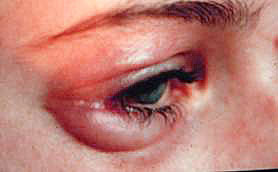 Rosemary was nineteen when she was referred because of intermittent attacks of swelling round the eyes as shown above. The history was she had been a screaming baby with diarrhoea, and she still got diarrhoea if she ate cheese She could not concentrate, had a very poor memory, and was moody and difficult to deal with, but this was attributed to being a teenager. 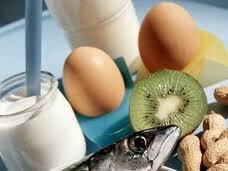 With this history and this time a positive skin test for milk total avoidance of milk products was advised. She became constipated for the first time in her life, and also underwent a remarkable change in personality. She could think clearly for the first time, stopped her antidepressant drugs, and took a weekend job as a waitress. She found that she could remember all the orders, kept her cool better than the other waitresses, and became an attractive lively girl. Test feeds showed repeatedly that beef and any sort of milk products reproduced all the symptoms and the facial appearance, and even a trace of milk in bread or in milk fed pork could not be tolerated. Half an hour after having milk on her cereal she would sit burping quietly, with swelling round the eyes and was nasty, aggressive, depressed, and weepy for the rest of the day. Immunological investigations were negative. Her first daughter had severe vomiting, colic, and diarrhoea on milk formula. That this was also due to milk intolerance was not recognised by the GP until I advised a changed to a soya formula. Weaning reproduced problems until it was realised that there was whey powder in the rusks. Avoidance abolished all symptoms, but when aged six she was seen again because of mood swings, tantrums, and hyperactivity linked with addiction to milk chocolate. She gradually tolerated milk, and at age eighteen has no problems. 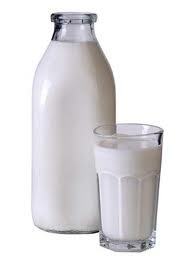 The second daughter now aged 15 still cannot tolerate milk, which causes emotional reactions and diarrhoea. Her son, now 13, was first seen aged one, and found to have IgE mediated allergy to egg.. He was a head banger with temper tantrums, and was apt to throw himself about and hurt himself, but after a month on a milk and egg free diet he was a delightful child and had ceased to bang his head on the wall. Unfortunately he has not avoided milk products strictly, especially in recent years. Ice-cream will cause an acute headache and when he went to school he had reading difficulties. He was diagnosed as dsypraxic and has had much remedial therapy since. He has great difficulty with writing and art, and is clumsy and uncoordinated, with behaviour patterns so similar to many other children with milk intolerance as to suggest that dyspraxia may sometimes be caused by milk. Hopefully he may be persuaded to avoid milk strictly to ascertain exactly how many of his problems are caused by milk, but it is clear that milk is an addiction. Katherine aged ten was seen with a history of being bottle fed, and had had eczema from birth to age four. Aged about one she had frequent sinus infections, and glue ears for which grommets were inserted twice. Her school report at age six commented that her behaviour and writing varied from day to day, sometimes with reversed letters when she had a headache. 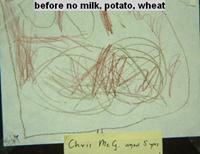 An example of her writing when she had a headache, and after avoiding milk for a week is shown below. She had very heavy shadows under the eyes, a high palate with orthodontic problems, and was wearing a T Shirt advertising Co-op Milk! Mother had noted that she became very hyperactive and aggressive after having anything containing dyes such as tartrazine. Immunology was unhelpful, with a negative RAST to milk, but milk avoidance soon brought a dramatic improvement. In the ensuing years with avoidance of milk products she progressed very well both physically and mentally, except when she had milk or milk chocolate, for which she has a definite addiction. The orthodontic problems and high palate, which may be due to unrecognized chronic nasal allergy, resolved completely. The reaction to milk chocolate finally took the form of migraine with visual disturbances, severe headache, looking like a ‘zombie’ with very obvious ‘shiners,’ and sleeping for up to 18 hours. Her behaviour at such times was described as aggressive and argumentative, with incessant crying and she once threatened suicide. In her teens it was difficult to persuade her to avoid milk completely because of the craving, yet she was a good athlete and won the county cross-country for her school. She eventually did very well at school, gained a very good degree in philosophy, and is now aged 25. She still has a craving for milk, her boy-friend commenting that she undergoes a completely change to a nasty personality a few hours after eating milk chocolate. John was first seen aged nine, with a history of severe problems with milk formulae which subsided when he was aged thirteen months, but then he began to scream incessantly and bang his head on the cot. Tantrums were such that he was uncontrollable, and by age two he tended to wander off and get lost if not supervised. He was very clumsy and uncoordinated, and was destructive. He would inflict pain on himself by pinching his arms and legs to produce bruises, and would throw himself down stairs and kick holes in the walls. His mother described him as “a manipulative destructive monster” who made family life a nightmare and was threatening to break up the marriage. To preserve her sanity she placed him with a registered child minder and went back to teaching as the head mistress of a local primary school. The next event was a cut head which required stitching at the local hospital, and when he was found to be covered in bruises she was sent for by the hospital and accused of battering him. She had great difficulty in persuading the paediatrician that his injuries were really self-inflicted. This was some years ago, but had this happened today she would have probably have been disbelieved and probably convicted of child abuse. Imagine the headlines! At nursery and infant school he was unsocial and aggressive, had frequent chest infections, and finally was diagnosed as asthmatic. His behaviour got worse with rudeness, aggression, and often violence. He would run and jump on the spot and make silly noises for long periods, repeatedly throw himself down the stairs, kick holes in the walls of his room, and continued to pinch himself and even cut himself, his clothes, or the furniture. He was referred to a child psychiatrist who blamed his condition on parental mismanagement and their inability to communicate, and suggested that he was being provoked by his sister who was considered very well behaved by his parents. Finally he was admitted to hospital for asthma, and on discharge was fortunately referred for allergy investigation. He was found to have a large skin test reaction to cats, but nothing else. The cats were removed without benefit, so acting on his suggestive history milk was totally avoided, and within a week became a nice little boy with normal behaviour. 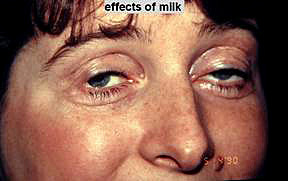 Deliberate or accidental ingestion of milk or milk products were repeatedly shown to produce dramatic relapses of behaviour, and the teachers at school began to recognise when he had been cheating by his behaviour, as he had a craving for all milk products. Isobel was fifty when she was referred for investigations of her migraine and allergic rhinitis. Her father and son were allergics, and eight years before a neurologist had diagnosed an unusual form of migraine causing numbness of the right side of the face. For the previous 18 months she had developed a very unusual problem, in that when she placed food in her mouth she would suddenly find that she had an irrepressible urge to cough, or to splutter and have to go to the lavatory and get rid of the food. She could not swallow until she had got rid of the food, and this often brought on an explosive cough, spluttering, and sometimes wheezing for a short time. There was no indication that any specific food was more inclined to cause this reaction. There seemed to be no clue whatever to the possibilities here, and a few foods diet was suggested as worth trying if only to eliminate food as a possible causes of this most embarrassing complaint. To my surprise she found that the problem did not occur on the few foods diet, and on reintroduction of foods one by one she found that every time she took milk products she began to cough, splutter, and wheeze after two days, lasting for a further two days. With milk avoidance her problem did not recur, but unfortunately the migraine did not seem to be food related. She has been lost to follow-up. 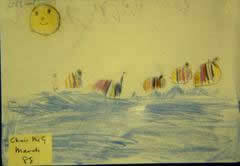 Christopher was five, and there was a strong family history of allergies on the father’s side. He was a very colicky baby on milk formula, and he developed asthma from age three with really dreadful behaviour for which his mother was blamed. He also had thirst, bedwetting, and large smelly stools. Mother had observed that when he had a stomach upset and could not eat for a few days he suddenly became a nice lovable little boy. The possible importance of this observation was peremptorily dismissed by the professor of Paediatrics who was looking after him, so mother demanded that he should be seen by an allergist. He was almost impossible to examine, a wide range of skin tests were negative, and he had a very distended stomach, very dark shiners under his eyes, and severe asthma. He was put on a diet of lamb and rice and in a few days all his problems vanished as if by magic. He became a lovely little boy who allowed blood to be taken without any complaint, and at school he could concentrate and sit still and pay attention for the very first time. Reintroducing potato, milk, and wheat all reproduced his behaviour and gut problems, confirming his problem was food intolerance. His father was always in a bad mood on Fridays, coinciding with having chips at lunch only on Fridays, and was much nicer when he never had potato. 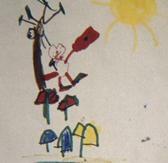 One of the objective results of the discovery that his behaviour was related to his food was evidence from his art-work at school, which changed from meaningless squiggles to recognisable objects, as shown below. Mark was ten when first seen, with a history of migraine and abdominal pains for about two years, with emotional problems at home and at school which had caused referral a paediatrician who, in spite of a very high Total IgE suggesting allergy, had suggested referral to an educational psychologist, The GP suspected milk allergy, and referred him for investigation. 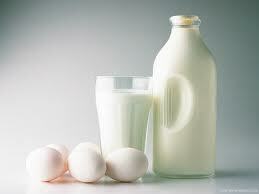 It was established that milk was indeed the major allergen, plus grandmother’s dogs. Taking milk or contact with dogs would produce repeatable optical illusions consisting of line, squares, or splodges of colour, then migraine. The tiniest amount of milk was enough to set him off, even eating some cake which had been made with margarine instead of butter, but with some whey added. This all cleared up after two years. Jennifer was six when first seen with eczema and asthma, and a strong family history of allergy on mother’s side of family. She was attending a child psychiatrist who thought that the effect of asthma on personality development was giving rise to infantile, demanding, unreasonable attitude to mother, etc. etc. She was very withdrawn and almost impossible to examine. The history pointed clearly to milk and eggs as the major allergens, but skin tests and RAST were very positive for dog, cats and mites, although exposure to animals and dust had no effect. Avoidance of milk and egg produced dramatic improvement in behaviour within a few days, and the asthma and eczema also subsided. She went on to University and a good degree in languages. Raymond was forty years old, and was an executive in a big company. Apart from seasonal hay fever, his main complaint was that he tended to become overwhelmingly sleepy in afternoon meetings, and could not stop himself from dropping off. He suspected that this was more liable to happen when he had had a Chinese or Indian meal at lunch.. I encouraged him to keep a food diary which established that whenever he had any rice he would literally pass out about an hour later, but not at other times. Avoidance of rice prevented this embarrassing problem, and he got promoted. Deliberate challenges with rice would reproduce the sleepiness problem without fail, and I found that he had a big skin reaction to potato juice. Avoidance of potato was also helpful, and reintroduction caused aggressiveness and irritability. He subsequently found that wheat and barley also had some effect, making his diet even more difficult. He is the only patient where I have found this effect from rice, but perhaps there are others out there?